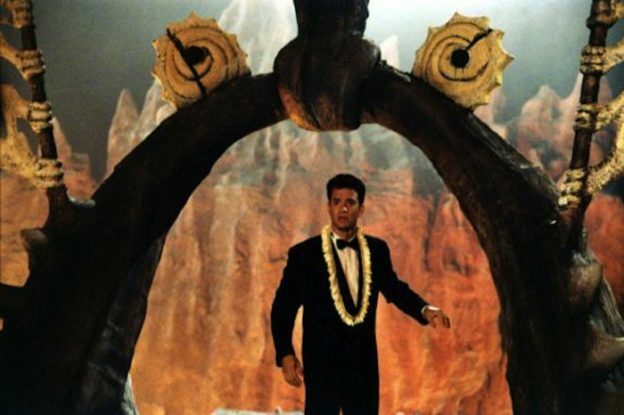 Best Movie Ever Joe Versus the Volcano is out on Blu-ray today! Go buy, go watch, fill your soul with joy, make this cult blossom into the behemoth it should have always been. I wrote (at length!) about why I love this movie so much over at Tor.com, and a couple weeks ago writer Ray Utarnachitt talked about it (at length!) on a podcast called Obsessed RN. He discusses finding the film at different points in his life – basically when he needed it most. He also said some very nice things about my aforementioned article. It makes me so happy that more people are embracing the film. I think ’90s audiences rejected the mix of earnestness and silliness, but at this point I think that precise is the only thing that might (might!) save us. It’s especially interesting to see JVTV’s influence on people like Bryan Fuller and Wes Anderson, who I think are doing similar work in balancing this sort of goofy optimism and whimsy with a dark undercurrent. Clearly, brain clouds are the zeitgeist. This entry was posted in Uncategorized on 20 June, 2017 by leahs.